On May 25th, barely 2 days after the High Court verdict which went against ISKCON Bangalore, ISKCON Bureau sent a resolution to ISKCON Bangalore. The resolution reads as follows in the beginning, with pertinent observations. 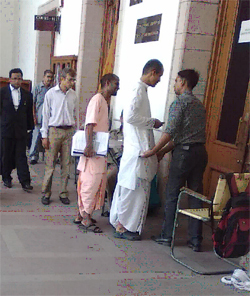 Sri Dinesh Vinayak Kocharekar, Temple President, Kolkata, seen roaming in the corridors of the Supreme Court of India. Notice the lack of shikha & growth of hair. The supervisory committee is chaired by Sri Dayaram Dasa aka Dinesh Vinayak Kocharekar. One would have expected more from the Bureau. This man is supposed to be the Temple President of Kolkata temple. There are certain minimum standards one would expect from a temple president. Sri Dinesh Vinayak Kocharekar, unfortunately, doesn’t seem to measure upto the standards. In fact, he doesn’t even sport a sikha! (please see snaps below). How the Bureau is encouraging this for a Temple President, is surprising. And to make a man who doesn’t even follow the basic directions of Srila Prabhupada, Chairman of a Supervisory Committee to look into matters of Deity Worship, is even more astonishing. building apartments and selling them in Sridham Mayapur. So the Bureau has virtually stuck its foot in its mouth – putting a man with personal businesses worth Crores of Rupees to supervise a Temple President who has declared in a court of law that his personal assets are almost nil! And a Temple President, whose following of spiritual standards and sadhana is impeccable to date – which even many of the self appointed gurus will find difficult to match, let alone Sri Dinesh Kocharekar aka Dayaram Das. Where this man got so much money to start such flourishing businesses, will definitely be interesting to know, considering that Sri Dinesh Kocharekar has not inherited this as a family business! (Grapevine has it that this man, being unaccountable for all the money spent by the GBC to create all the legal tangles in Bangalore, has siphoned off huge sums of money from this. He is said to have pumped all the ill gotten wealth he has amassed thus into his family businesses). Surely, the Bureau was expected to do much better than this! Obviously, from this we can see, that the Bureau’s idea in putting Sri Dinesh Kocharekar as Chairman of the Supervisory Committee is not based on any spiritual standard or achievement of this gentleman but simply on other unconstitutional grounds. As they say, if the head is rotten, then the whole body obviously must be rotten. If the Chairman of the Supervisory Committee (of businessmen) is of such low standards, then we can only imagine the standard of the rest of the members of the committee! The members of the Supervisory Committee (of businessmen) include Sri Varadakrishna Dasa and Srimati Radhapriya Devi Dasi aka Srimati S P Rajeshwari. It is interesting to note that these 2 persons are married husband and wife. This man Sri Varadakrishna Das has been hopping mad all over the media that the ISKCON Bangalore Society is controlled by Sri Madhu Pandit Dasa’s family – though, as is usual with all his allegations, this is a totally baseless and untruthful allegation. For the record, ISKCON Bangalore is governed by a Governing Body consisting of 10 members, who are from different parts of India and are not even remotely related to any other of the members, save and except two of the members – Sri Madhu Pandit Dasa and Sri Chanchalapathi Dasa. However, the interesting point is that the Bureau has appointed a Supervisory Committee of family members, purportedly since the Bangalore Society is governed by family members! What an irony! Or is it diplomacy? Or is it plain blind sightedness? Choose whichever you would like! So, it turns out that this Supervisory Committee is one of family members and businessmen. The Supervisory Committee of family members and businessmen has been entrusted with a number of “responsibilities” by the Bureau. 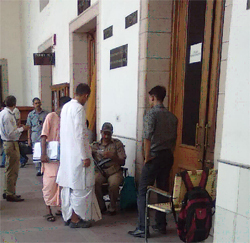 Considering the constant harping in the media by Sri Dinesh Kocharekar aka Dayaram Das and Sri Varadakrishna Das that there has been large scale misappropriation of funds and fraud at ISKCON Bangalore, one would expect that that is what the Supervisory Committee of family members and businessmen would primarily be burdened with. But the actual reason for all this fight and legal battle is given away by the fact that the first responsibility of the Supervisory Committee of family members and businessmen is to “check the system & standard of Deity worship followed by the Bangalore branch”. This is a dead give away! This shows what is top on their minds – CHANGE THE SYSTEM OF GURU WORSHIP! Remove Srila Prabhupada from the center of this magnificent temple and replace him with their self appointed gurus! Their unbearable envy towards Srila Prabhupada occupying the center of this crest jewel of a temple has resulted in the Bureau blurting out their intentions. Otherwise, when there are more pressing matters (so called), why take up Deity Worship first, of all things, when Deity Worship was never questioned all along anywhere by the Bureau or Sri Dinesh Kocharekar or Sri Varadakrishna Das in any of their media rantings. So that shows where the rot is – it is right in the head, at the Bureau and the GBC level. THEY ARE ENVIOUS OF SRILA PRABHUPADA’S BEING THE CYNOSURE OF THE OPULENT BANGALORE TEMPLE. That rot has spread naturally to the Chairman of this Supervisory Committee of family members and businessmen, who doesn’t even sport a sikha and runs his personal businesses worth millions. It is sad that the Bureau has appointed a Supervisory Committee of family members and businessmen to supervise devotees! On 3 counts at least, this Supervisory Committee of family members and businessmen is unconstitutional, uncalled for and has been made with the sole hidden agenda of replacing Srila Prabhupada at the center of the temple. If anyone still can’t see it, he must really be super blind.